Start pedaling and you’ll discover that Massachusetts is bike friendly for all ages and abilities. 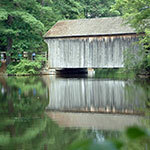 In country or in town you can travel former railroad and trolley tracks, riverbeds and shoreline, parks and greenways. There are paved roads, car-free service roads and off-road trails. Bike through historic and indescribably scenic places, on flat and hilly terrain, on marked and handicap accessible stretches. You’ll find comfort stations and concession stands, bike rentals, parking, and access to public transportation. Stay in a cozy B&B or relax at a nearby spa after a day out. Ah! Discover the beauty of Cape Cod and the 429 emerald acres of Ocean Edge Resort & Golf Club on the Resort’s shiny and sharp fleet of Freedom Flyer bikes. Enjoy direct access to the 26-mile scenic Cape Cod Rail Trail, which has become a haven for bikers, walkers, and joggers, and is dotted with plenty of opportunities to visit beaches and ponds, or to grab lunch or an ice-cream cone. 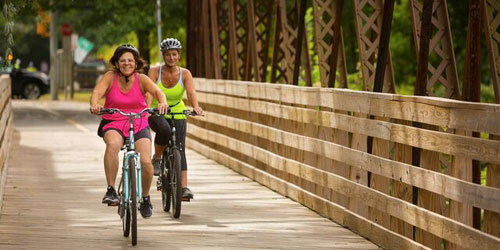 Be sure to check the Resort’s seasonal package offerings, which often include bike rentals. Whether you are new to the area or looking to find a new spot, guests will love the Resort’s bike itineraries, which highlight local favorite spots stretching from Brewster to Provincetown. 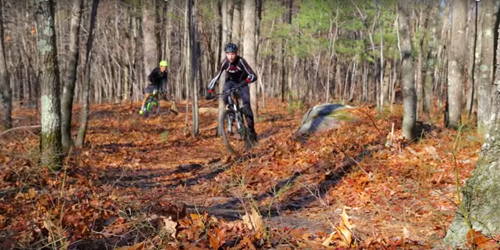 With its 7,000 acres of varied terrain, from rocky outcrops and challenging climbs to paved pathways through gently rolling landscapes, the Blue Hills Reservation is a must-see stop for bikers of all ages and abilities. In this urban oasis, you can pedal through forests, along ponds, across pine woodlands and bogs. Visit the Blue Hills Weather Observatory or one of more than a dozen other important sites that tell the tales of local history. Mountain bikers are welcome: Their reward for a rugged climb is always a spectacular view. 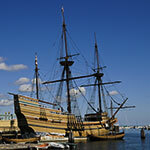 Outside of the reservation, bikers in Quincy have access to beaches, historic sites and cozy neighborhoods. 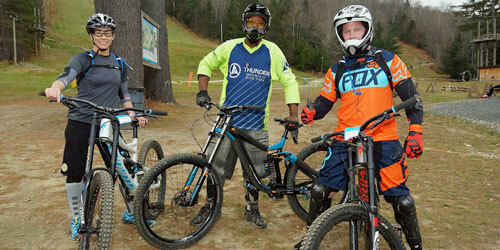 Mountain bikers have come home to the Berkshire East Mountain Resort. Beginners to double-black trail riders can experience the thrills of racing down intricately crafted courses at the resort’s Thunder Mountain Bike Park, New England’s fastest growing downhill mountain bike park. Lifts take bikers up to trails, many designed by Gravity Logic, that range from gently descending to steeply elevated and narrow. Obstacles, natural and manmade, range from tight trees to wood ramps and challenging jumps. The park supplies high-end rental bikes and safety gear, certified instructors offer lessons, and an on-site technician is available for repairs. At the end of an exciting day, enjoy a meal at the Crazy Horse Bar and Grill. Riverbend is not a park, but rather the informal name for a one-mile stretch of Memorial Drive in Boston from Eliot Bridge to Western Avenue that is closed to vehicle traffic on Sundays from 11 a.m.-7 p.m. from the last Sunday in April through the second Sunday in November. Mountain biking is allowed on the Chesterfield Gorge property, but only on River Road (also called East Branch Trail). Bikers can get access to this road / trail from the parking lot. See full description of Chesterfield Gorge, with information on hours, admission, what to see and do. The Cape Cod National Seashore maintains three bicycle trails ranging from 1.6 to 7.3 miles long. Motor vehicles, including mopeds, are prohibited on bike rails. Bicycles may be rented within the towns. This trail connects Salt Pond with Coast Guard Beach. It leads through pine and oak forest with vistas of Nauset Marsh along the way. This trail is wheelchair accessible. Distance is 1.6 miles. This level trail skirts the edge of a freshwater marsh and provides glimpses of the marsh and dunes. Distance is 2 miles. This hilly trail winds among beech and oak forests, sand dunes and freshwater ponds. The loop trail is 5.45 miles, with spurs to Herring Cove Beach, Race Point Beach and Bennett Pond. 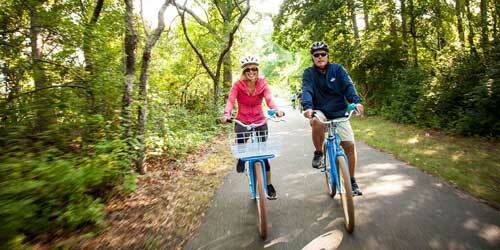 The Cape Cod National Seashore maintains three bicycle trails ranging from 1.6 to 7.3 miles long. Use of motorized vehicles, including mopeds, on these paved trails is prohibited. Bicycles may be rented within the towns. Nauset Trail in Eastham connects Salt Pond with Coast Guard Beach. (1.6 miles). Head of the Meadow Trail in Truro skirts a freshwater marsh and provides glimpses of the marsh and dunes. From High Head Road in Truro to Head of the Meadow Beach (2 miles). 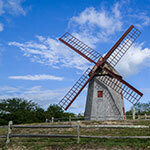 Province Lands Trail in Provincetown winds among beech and oak forests, sand dunes and freshwater ponds. The Mystic River Reservation is a string of parks and greenways along the Mystic River. It includes lots of trails for biking and walking. 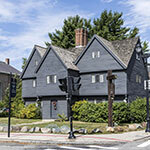 Accessible from Boston and Cambridge by MBTA commuter trails. See full description of Mystic River Reservation. See bike trails map of Mystic River Reservation. The Southwest Corridor Park is a 4.7 mile, 52-acre, linear park stretching from the Back Bay to Forest Hills. 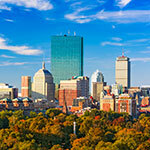 It links the neighborhoods of South End, Back Bay, Roxbury and Jamaica Plain with a street-level, green open space for parkland and recreation. Approximately a quarter of the parkland is decked over the railroad tracks. Adjacent Streets, starting from the Boston Back Bay T station, include Carleton Street, Columbus Avenue, Tremont Street, Centre Street, Lamartine Street, Amory Street. Adjacent to Arnold Arboretum at the southern end. The Cape Cod Rail Trail follows a former railroad bed for 22 miles through Dennis, Harwich, Brewster, Orleans, Eastham and Wellfleet. Its paved surface, few hills, and well-marked road crossings make it ideal for cyclists. The trail has a wide unpaved shoulder on one side to accommodate horseback riding, walkers, and runners. This 14-mile loop follows both banks of the Charles River from the Museum of Science in Boston to Watertown Square in Watertown. The quality varies from 12 feet wide with center stripes to 4 feet wide with 6-inch drops at the edges. In some places it is barely wide enough for one bicycle to pass another; in others, there are separate bicycle and pedestrian paths. The path can be entered at any point on the Cambridge and Watertown sides, from all but the Longfellow and Boston University bridges on the Boston side, and from footbridges over Storrow Drive. The Urban Parks Division of the Massachusetts Department of Conservation and Recreation (DCR) manages and maintains this path.